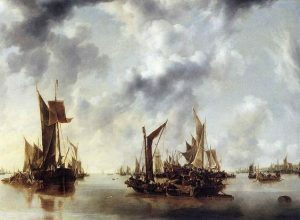 What Is the Best Sailing Ship Painting? As you already know, we are not just professional shippers of fine art – we are also true connoisseurs who appropriate art in all its many forms. This is exactly one of the reasons that make Fine Art Shippers a perfect choice for any fine art shipping or handling job. We take pride in working with some of the best contemporary artists, including Vladimir Nazarov, Will Yaya, Tigran Tsitoghdzyan, and Henry Richardson, shipping artwork for them both across the United States and internationally. Besides, our expertise is not limited to only contemporary and modern art. We also ship antiques of any kind, including museum-quality furniture pieces are grand pianos. However, in this blog post, we want to draw your attention to marine art, a very special form of figurative art that takes its inspiration from the sea. 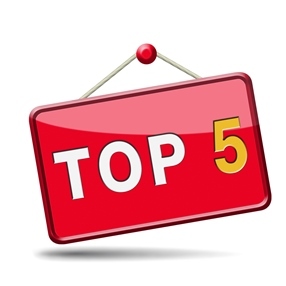 Moreover, we are going to share with you our top 5 list of real masterpieces created by some of the world’s most influential artists. Each sailing ship painting you can see below is amazing, and each of them is undoubtedly the best in its own way. Enjoy! “A Calm” is a fantastic sailing ship painting by Jan van de Cappelle, a famous Dutch Golden Age artist largely known for his winter landscapes and seascapes. It can be seen in the National Museum Cardiff. 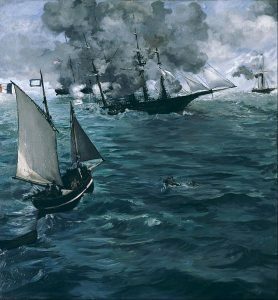 Another masterpiece on this list is the sailing ship painting by Edouard Manet, a renowned French artist who is considered one of the founders of Impressionism. It is currently on view at the Philadelphia Museum of Art. 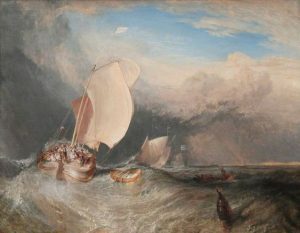 It is impossible not to mention “Fishing Boats with Hucksters Bargaining for Fish,” a violent ship painting by the English Romantic artist Joseph Mallord William Turner. This beautiful artwork is on display at the Art Institute of Chicago. 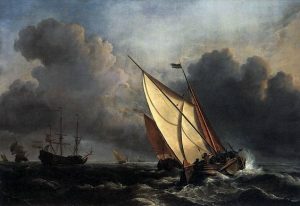 Created circa 1672, “Ships on a Stormy Sea” is one of the most prominent works by Willem van de Velde the Younger, a well-known Dutch marine painter. It is currently part of the Toledo Museum of Art collection. 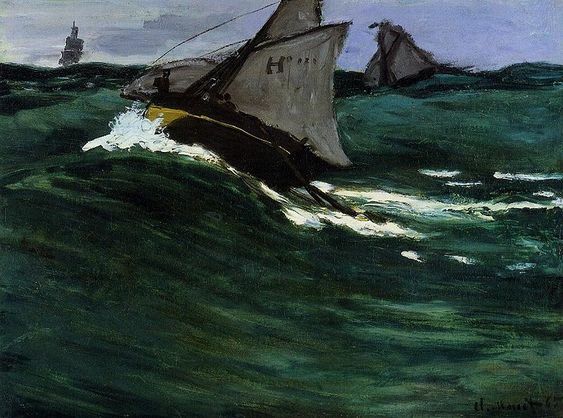 Finally, one more amazing sailing ship painting on this list is “The Green Wave,” a truly impressive work by the founder of French Impressionist painting Claude Monet. It is on view at the Metropolitan Museum of Art of New York.